Most bands with guy-girl front-duos tend to improve when the guy stops singing: take Asobi Seksu or Camera Obscura. (The exceptions to the rule are generally Best Band Ever expectation-defiers like Yo La Tengo or, uh, the Velvet Underground.) On Elephant Parade’s Home, however, Estelle and Ido (who don’t list their surnames on FayBoo) share their duties with equal aplomb. You won’t make it through the record without a healthy tolerance for spare bedroom downers (two thumbs, this guy, etc. 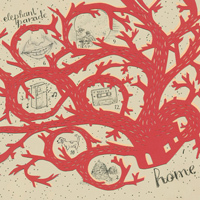 ), but Elephant Parade offer a refreshingly capable spin on homemade sad-pop and sunnier efforts alike. Oh, and that battle of the sexes? Mission accomplished. Stream and buy the album after the jump via Bandcamp.